Rainy day outside, thought something mellow might feel good, that I might show up with something more relaxing, esoteric, whimsical, whatever — it’s nice to let material breathe so I tend to work to fire one or two heavier pieces a week that might take more digestion (and might spark realisation of my own errors or further questions), one personal anecdotal piece, one update on the whole process of trying to write/prepare/raise awareness of a book, plus I kinda like taking some time to turn the eye away from me and place it on the amazing things people have done out there in the world with their Nirvana fandom; it’s why I’m able to keep this going month-by-month, people keep inspiring me with their stories and works. 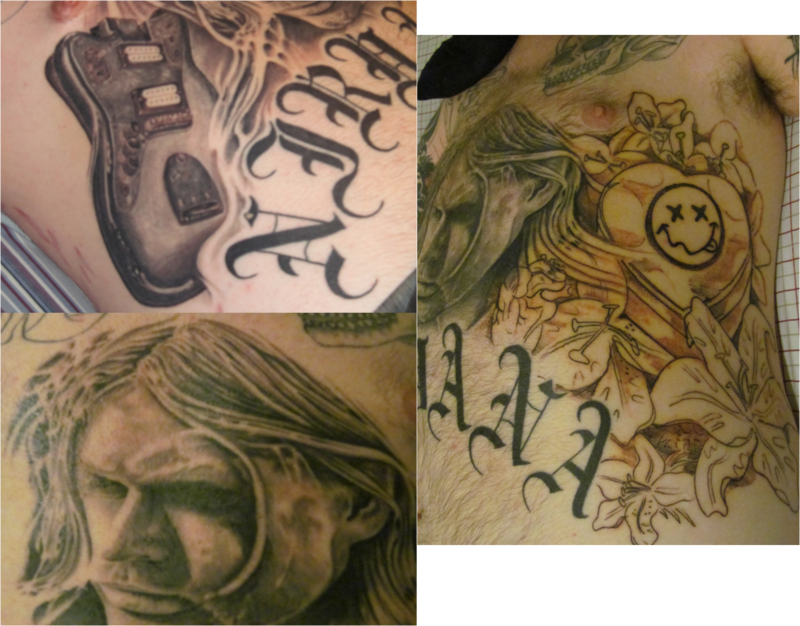 These are Lee’s Stomach tattoos, I mean, wow…Fairly considerable amount of work going on here to say the least. The overlaying of Nirvana imagery, the flowers, the heart-shaped box, the smiley, the beautiful lettering. I like that it’s a ‘non-standard’ Kurt Cobain image used, the profile shot, the level of detail incorporated into the image — beautiful work.